RAL coloured glass splashback. Cut to size from optically clear, low iron glass. The glass is then toughened and is temperature resistant to over 400C. Suited for use behind any type of cooker and for wall coverings in your kitchen and bathroom. We use a fully digital colour mixing system that enables us to match any RAL paint colour with a very high degree of accuracy. (We do not use actual RAL paint as it is not suitable for glass. Our system can provide indistinguishable colour matches. With lots of RAL colours to choose from, picking a RAL colour for your custom splashback is easy. Browse or search our website to see our range, or drop into a decorating store for inspiration. We offer a sample product to help you see your colour on glass. 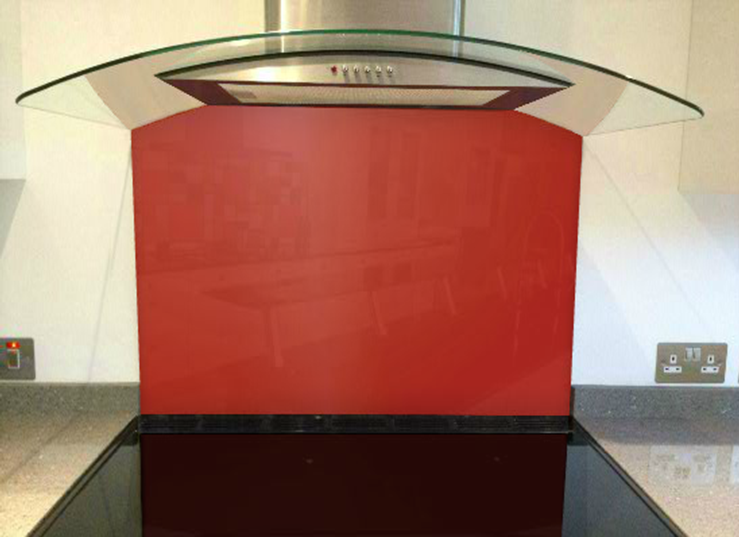 To order a RAL 3016 glass splashback sample please click here. Your glass upstands will be cut to your specific size and produced as toughened glass. Please be aware that toughened glass cannot be cut so it is important to measure accurately. Glass upstands are usually 100mm - 150mm tall. They are fitted in the same way as a splashback. Upstands add a touch of colour along with more practical wall protection. Measuring for your glass upstands is easy. 1) Measure from your cooker splashback to the nearest wall or cabinet and deduct 2mm for expansion. If you have not decided on the colour for your walls or cabinets then that may be the best place to start. Would you like your RAL 3016 Splashbacks to complement or contrast your walls for example? Some tips on chosing the right coloured splashback for your kitchen or bathroom. Consider the lighting in your room. 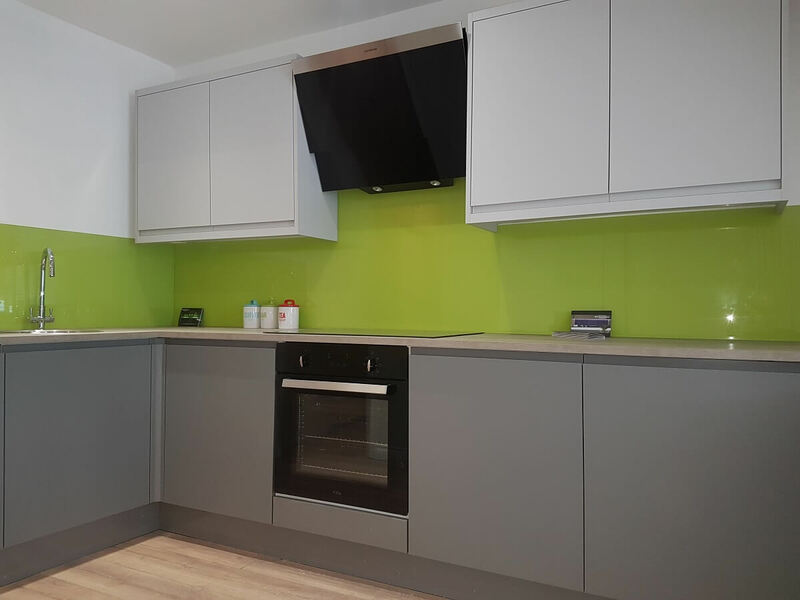 Like paint, our splashbacks can be made in matte (brushed) or gloss finishes. What mood are you trying to create? Like tiles, glass splashbacks can be cut and shaped around electrical outlets or plug sockets. They can then protect your walls around switches just as tiles do. 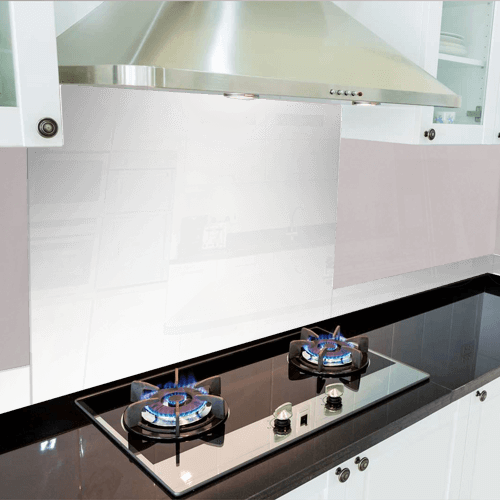 This image shows two RAL 3016 glass splashbacks meeting in a corner, under your kitchen cabinets. Measuring for full wall glass splashbacks is a little bit more involved than with upstands, however the fundamentals are the same. You can find further instructions on how to measure for plug sockets etc... in the tutorials section of our website. Click here to visit our tutorials section. You catch it, we'll match it! Using our colour catcher mobile app you can use your mobile device's camera to capture any colour. Once you have found the perfect colour for your kitchen splashback our app will take you directly to the closest glass splashback colour we have on our system. Our app is of course only as reliable as your phone's camera so it may be an idea to either order a sample or visit your local paint store to pick up a paint sample to check. Copyright © 2019 DIY Splashbacks. All rights reserved.